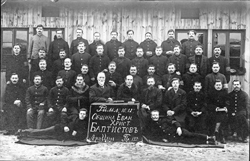 Description: Group of men posed outdoors against a building, with Russian sign or banner in front of them. The sign says Romans 10:12 on the top line, then Society of Evangelical Christian Baptists. The bottom line looks like "L-rya Tselle Pe. 132" but who knows what that means? The person behind the sign on the right is Jakob Kroeker (1872-1948). This might be work of the Licht im Osten mission with World War 1 Russian prisoners of war in Germany, but the photo looks a little bit more recent than that, maybe 1920s.